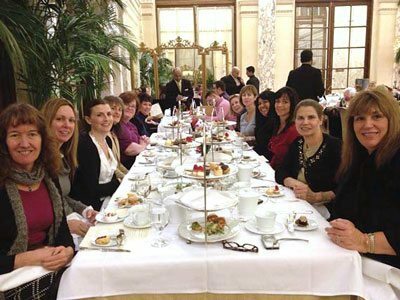 Join Debbie Prevor as she hosts spouses and significant others to a day of pampering, tea at the famed Plaza Hotel, sightseeing and shopping. First, Spouses/companions are invited to accompany registrants to the Opening Cocktail Party. Second, Spouse/Companion registrants receive exclusive use of a suite at the Hilton Hotel set aside to be “ground central” for a New York experience. The suite serves a continental breakfast, refreshing beverages and an assortment of petit fours, tea sandwiches and, of course, fresh fruit and vegetables throughout the day. Come by in the morning and prepare the day by having your makeup applied by an expert or you can get a quick manicure before you head out to see New York City. Third, participants will enjoy an out-of-hotel tour. Starting out with a morning site-seeing and shopping expedition to experience Manhattan’s most unique retail stores, including a visit to the world renowned Bergdorf Goodman and the flagship store for Tiffany & Co. There will also be an exclusive coach serving the program participants to take the registrants on a whirlwind tour — get on and off as you please or stay with the group — to top museums, historical sites, Chinatown, Little Italy and much more. The sightseeing and shopping expedition will be capped off with High Tea in The Palm Court at The Plaza as a highlight of the day — all complimentary as part of the program. The New York Produce Show and Conference is a fabulous opportunity to work hard and play hard. If your spouse or companion is able to join you in New York (which is magical with lights and holiday decorations this time of year), you may well want to consider this very special program at an all-inclusive price of $295. If you have not registered for the conference and wish to register your spouse/companion, you can do that here. If you have already registered for the conference and wish to register your spouse/companion, you will have to modify your registration by going here.